Acrylic on Canvas, 2015. 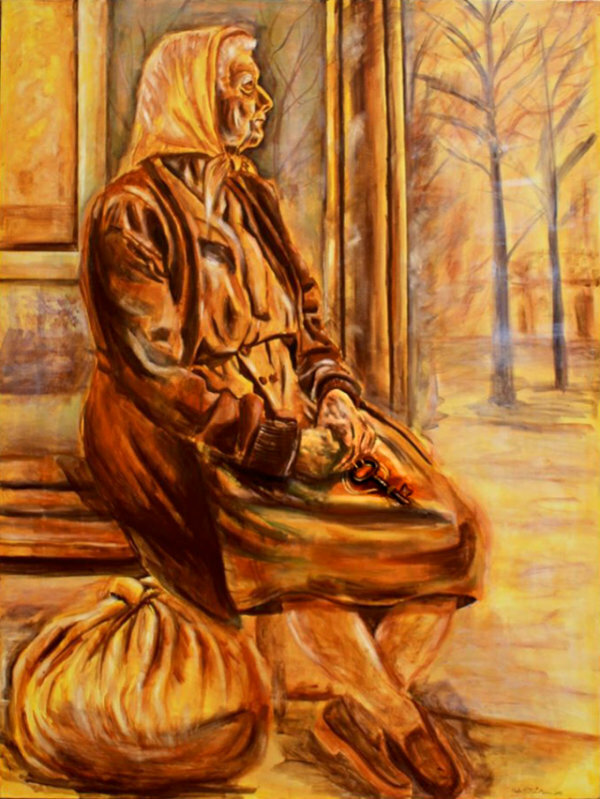 123 cm × 92 cm. From my most recent series titled “Under the Sky” which tackles issues of identity, memory, displacement, as well as refugee and immigration issues. Huda Salha is a Palestinian-Canadian artist with many years of experience in painting. As a descendant of a dispossessed Palestinian family, Huda’s visual narratives are informed by childhood memories, family anecdotes and historical and geographical references. Her work reflects larger issues about an entire nation sharing the same cause and they explore the historical, cultural and psychological sense of place. She is interested in the way identity and memory are interwoven with place through political and cultural boundaries. Huda : "I have used art, not only to explore my internal landscape and reflect on my own position as a descendant of a dispossessed family. My personal work has therefore also expanded into a critical awareness of current dilemmas in the world around me, including questions of mapping, diaspora, and ongoing incidents of racial stereotyping. The collective migrations taking place in the past and today evoke my own memories and is evidence of how past history is constantly reconstructed in the present."